This week’s prompt for Flash Fiction for Aspiring Writers reminded me of one of my favourite spots to visit in the UK: Lindisfarne (or Holy Island). So I have TJ Paris to thank for bringing it to my mind. This is his photo . . .
. . . and my story can be read here. I’ve always been fascinated by offshore islands, whether inhabited by humans or simply by colonies of seabirds. It has been suggested that there as many as 5000 islands in total around the coast of the UK – a number difficult to verify as it depends on a person’s definition of an island. 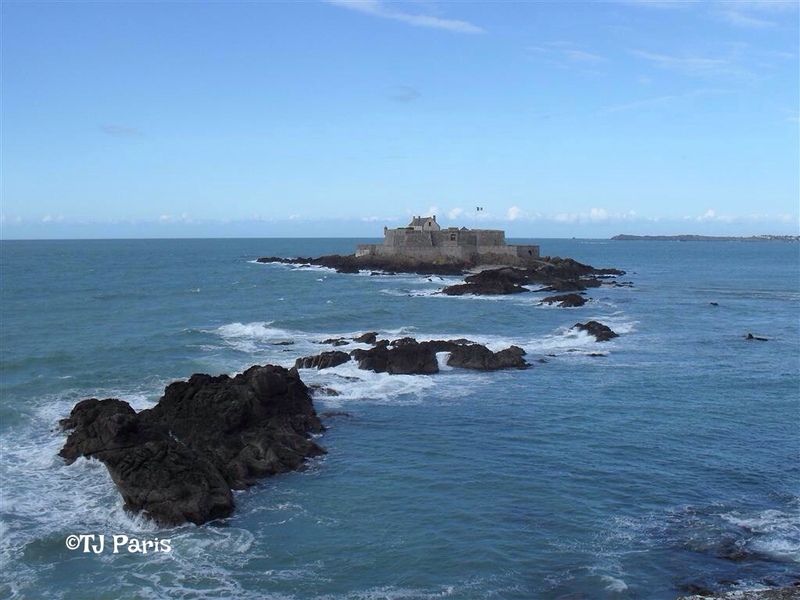 Some ‘islands’ may be just small lumps of rock. But there are certainly more than 1000. 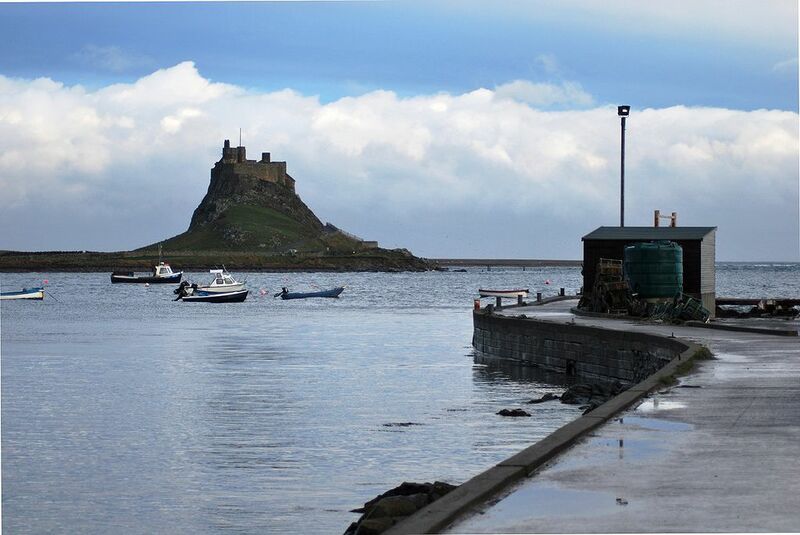 As for Lindisfarne, it is well worth a visit. We usually head up there when we’ve been staying around Hadrian’s Wall, just for a change for a day out. It has a lot to offer for tourists, including the requisite souvenir shops, hotels, restaurants and cafes etc. Of course, most people go there to see the historical sites. 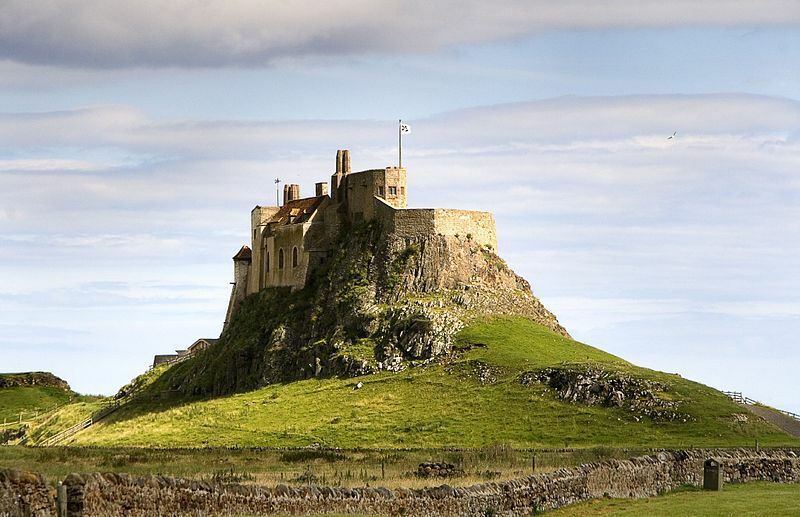 Lindisfarne lies just off the coast of NE England, in the county of Northumberland. 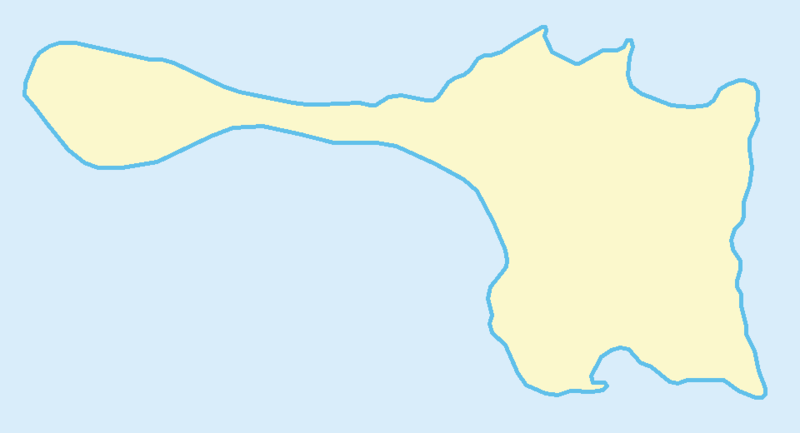 It is connected to the mainland by a tidal causeway, and there is a castle and priory on the island. 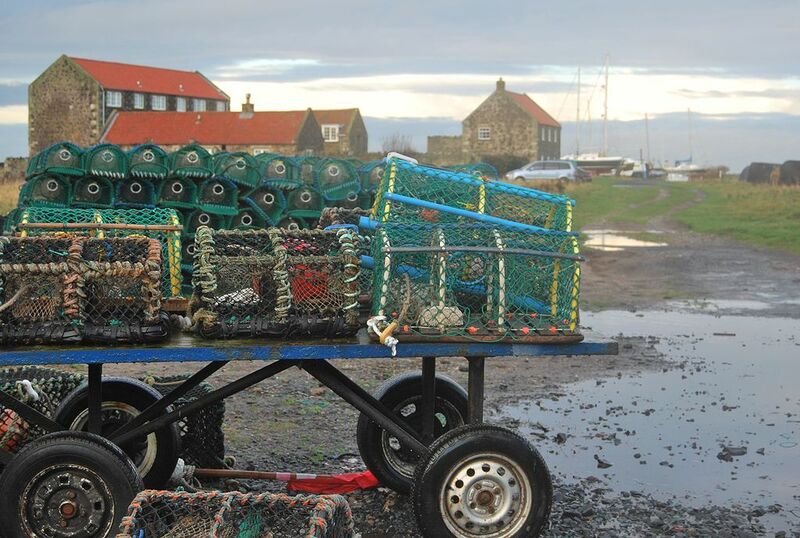 Much is written about the history of Lindisfarne and the ‘saints’ who came after St. Aidan. But the event that captures most people’s interest – most certainly mine – is that of the Viking raid on the island in 793. This event is now taken to be the beginning of the Viking Age. These raids by Norwegian Vikings were not followed up. Most of the later raiders sailed north around Scotland. The 9th century invasions came from the Danes … which, of course is the topic of my books. 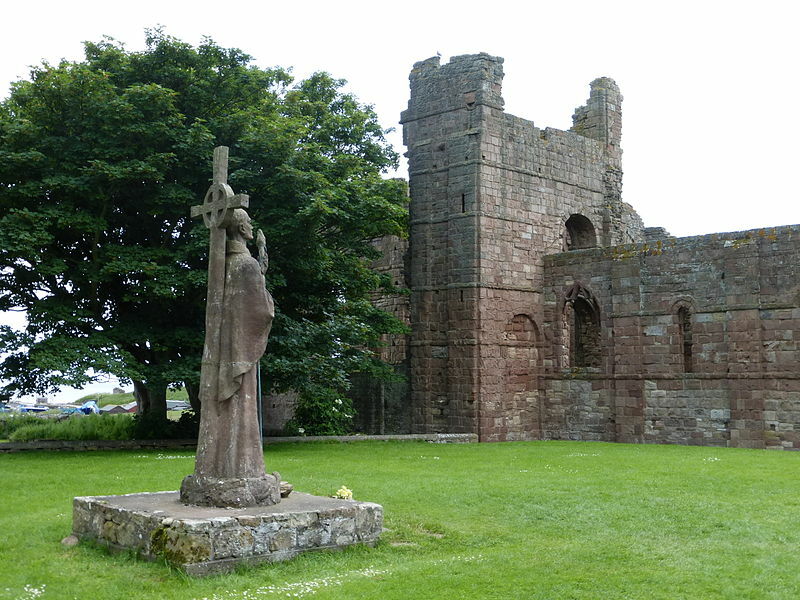 The Priory on Lindisfarne was built in the 11th century on the site of the Irish-styled monastery founded by St. Aidan in 636. Here are some pictures of the ruins today. 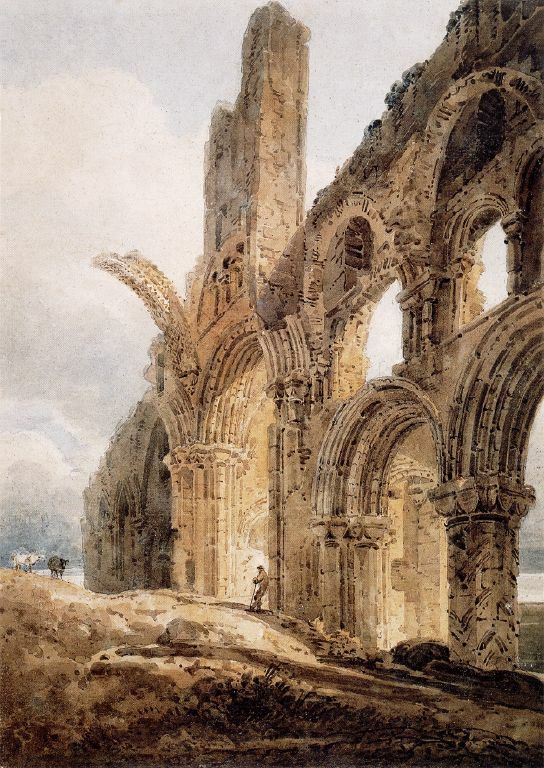 Remains of Lindisfarne Priory: 1798 by Thomas Girton. The priory’s rainbow arch (which still survives) is shown truncated for artistic effect. The castle was built in 1550 by Henry VIII in defence of the realm against attack by Scotland and in pursuit of their Spanish allies. It is said to have been constructed of stone taken from the priory. 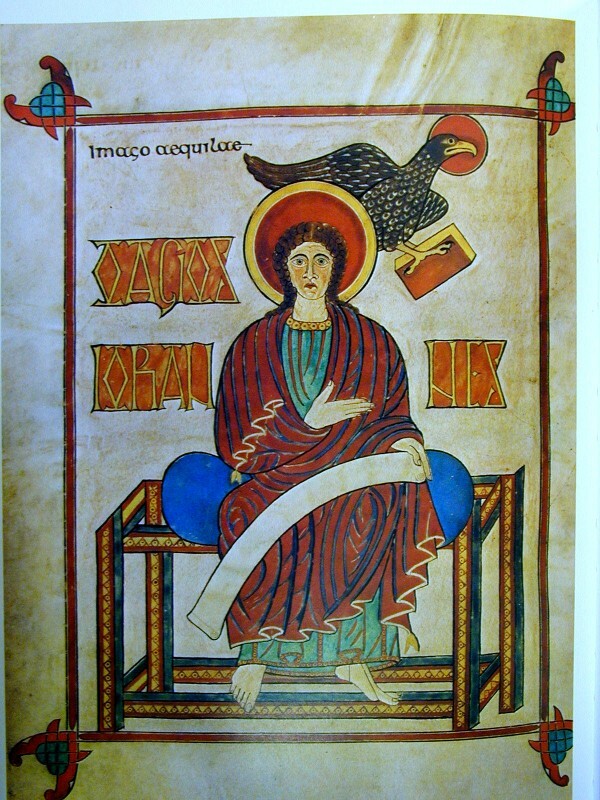 The Lindisfarne Gospels are among the most celebrated illuminated books in the world. A 10th century inscription at the end of the text was made in honour of God and Saint Cuthbert by Eadfrith, Bishop of Lindisfarne, who died in 721. 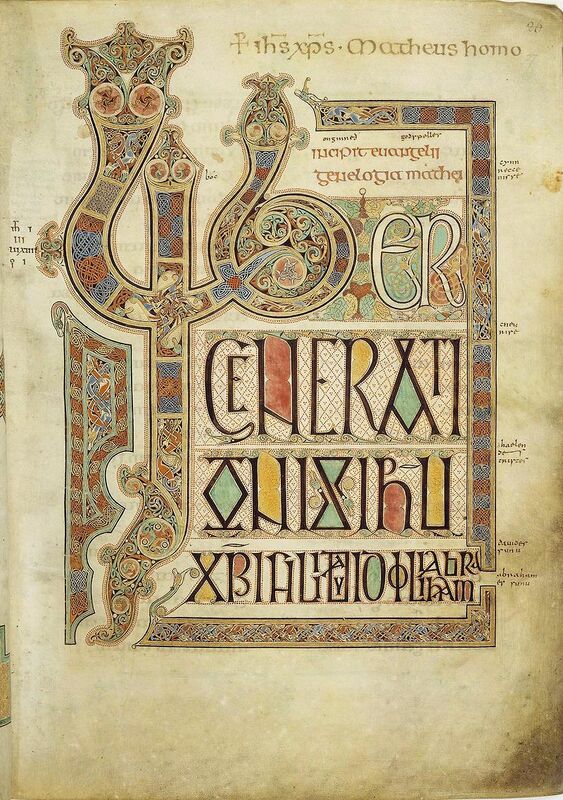 The Lindisfarne Gospels are part of a collection of Sir Robert Cotton (died 1631) in the British Library in London. Great post Millie! I’ve heard about the island before whilst researching Vikings. Hope I can visit it come day, i’ve been near (Bamburgh Castle) and i’d like to make the trip over sometime! Oh yes meant to say thanks! 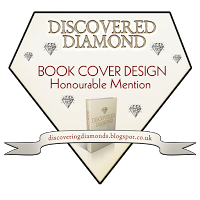 I’m not really doing awards as keeping the blog just as a travel diary, but did appreciate the mention thanks! I had a feeling that was the case, and understand your reasons very well. Thay take time to do, too. Lindisfarne is quite a special place. It looks quite awesome when the tide comes in and covers the causeway. If you’re at the castle you’re stuck for a good few hours! The castle is very small compared to most in Britain, but it’s in good condition and interesting to look round. It’s actually still lived in, too! I have never been to see them myself! The US is such an enormous place, isn’t it? You not having visited those places is like me saying, I’ve never been to Poland, or Austria. Britain is so small and compact, and nowhere ever seems very far away. I suppose if I visited the US, I’d have to pick just one site (unless I win the lottery – which isn’t likely). The Grand Canyon and Yellowstone are in the same region of the country, But both are so large one would need weeks to properly explore them! I definitely need to win the lottery, then. A holiday of that length would cost … well, a lot! I can still dream. I hope you dream your dream, Millie! I’m not quite antique status just yet, although it’s looming on th horizon. But the Queen is doing very well. Her mother lived to be over a hundred, so Perhaps she will do, too. Heaven knows how old Charles will be when he becomes king! Most likely Charles will be king for a very short time indeed! True, unless ‘Mrs. Queen’ abdicates soon. Even if she did so now, Charles is already 67, so still old for a ‘new’ king. Very interesting! Sometimes when I look at these amazing crumbling stone structures that were built so long ago, I feel exhausted thinking of all the effort it took those people to construct them. Lovely to visit this one without having to traipse across the pond:0)) Thanks! 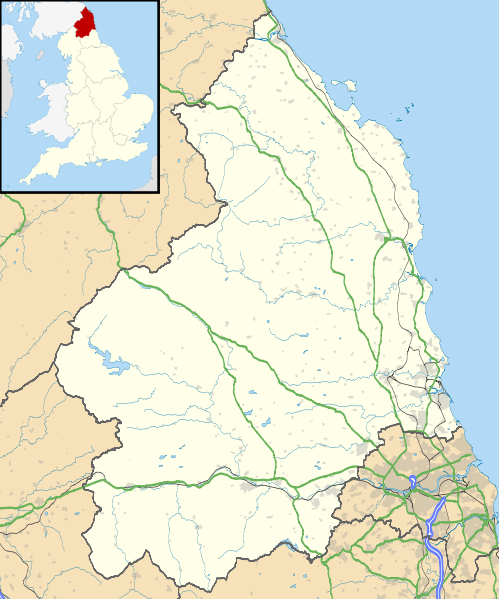 Yes, Lindisfarne was where it all started in the Anglo Saxon lands (there was no England yet – that came later when all the kingdoms became united). That raid on Lindisfarne is famous for the onset of the Viking Age. They were Norwegian Vikings, though. The Danish raids started later, just before the beginning of my Book 1. This is very interesting Millie! I enjoyed viewing the photos and reading your article! Millie, I don’t mind you adding extra to your stories. As long as you enjoy doing that I am perfectly fine with it. It is entirely up to you. Well. if it’s going to be a short one, I’d like to keep it with the story, if that’s OK with you. I’ll just do longer ones separately. That’s entirely up to you. I don’t mind you making that part of your story post as you have been doing in the past. The readers always have the option to read it or not. Personally, I always enjoy reading your extra information because they are so interesting. Okay. I’ll take it. Do you think we can add a clause about moving Lindisfarne though. There’s some great volcanic rock here and the scenery is nice. Besides, how could it possibly cost to move a castle? This is the first time I have read and seen Lindisfarne on the net. It is totally fascinating, and what a magnificiently grand structure on that volcanic pinnacle poised out in the water! Especially interesting because of its immense historic significance. (And the fact that the Vikings I series featured it). This would be a very special place to visit and I wouldn’t mind if I was stuck there for a good few hours! Thanks for showing me this piece of history, Millie. Bit jealous that you got to be there and touch Viking History!!! It’s quite esay for us to visit it, Amanda, as it’s only a three-and-a-half hour drive from here. It could be done as a day trip, but we usually stay up there when we go. The history is very interesting and they do make it educational as well. The castle’s a relatively young one, having been built by Henry VIII, which is why it’s in good condition, and still lived in. I didn’t realise Lindisfarne had featured in the Viking series. I knew the series was set over 50 years before my story started, but the raid is well described in the AS Chronicles. My Vikings are Danes, too, not Norwegians. I’m jealous that you’ve been to so many places in Scandinavia! I’m itching to bet to Birka, but other things keep popping up to put that back a while. You might have to visit Scandinavia ethereally through my posts in the same way as I visit English destinations through yours! Are you going to watch the Viking series. Ragnar Lothbruk is played by an Aussie actor. And I am glad your Vikings are Danes, who are clearly the supreme Vikings of old….. tee hee! Are you home again now? I know you haven’t been for a while. Yes I am back now. My blog been a bit quiet the last week or two. The Ragnar character is fascinating and a bit enhanced by myth like Robin Hood I feel. The series doesn’t always follow history but they do try to make the set ad costumes as authentic as possible. I am glad you write about the Danes 🙂 I also find Canute’s story enthralling. Must read your book one day. It gets harder the more blogs you follow and the more followers you get. Don’t let yourself get overwhelmed. I had to stop all wordpress emails fir a short time at one stage to have some breathing space. Thank you for those comfoting words. I haven’t got that many followers, but I have been trying to get round as many as I can every week. It is hard, and my writing is suffering (time-wise) so I’m feeling quite stressed right now. I really appreciate your kind thoughts.